Tasty Tuesday – Sweet Potato Biscuits | Who Are You Calling Crafty? The first time I made these was 2003 it was our (Jeff & I) second Thanksgiving together and my first Thanksgiving dinner I had ever cooked by myself. I wanted to make a fantastic Martha Stewart Thanksgiving dinner complete with Sweet Potato Biscuits, little did I know how bad they would turn out. I did not have a food processor when I attempted these the first time (BIG MISTAKE!) I used a blender to puree the sweet potatoes and got boiling hot sweet potato puree on my hand. I proceeded to shake my hand violently getting pureed sweet potato all over the kitchen (including the ceiling). I should have stopped but I wasn’t going to let a burned hand and a kitchen covered in sweet potato puree defeat me. I finished the biscuit dough and decided to put the biscuits in with the turkey (BAD IDEA!) The biscuits were not only charred black but they were doughy in the middle. I was so mad and Jeff being the amazing guy he is, tried really hard to eat the biscuits. Fast forward to 2008 I made the biscuits again (followed the directions EXACTLY!) and they turned out fantastic. I recommend making these a couple days ahead and freezing them and reheating them the day of. 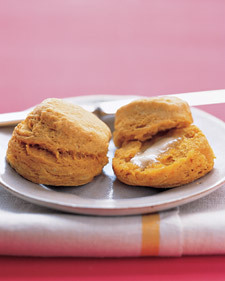 Yes this is a Martha Stewart Recipe but these biscuits are so good! 3/4 cup chilled Sweet Potato Puree – Dice and peel 3 large sweet potatoes put in a pot and boil for 45 minutes. Cool slightly and put in a FOOD PROCESSOR (DO NOT USE A BLENDER). Puree until smooth. Can be froze – I recommend doing it in 1 or 1/2 cup measurements. In a large bowl, whisk together 1 3/4 cups all-purpose flour, 2 tablespoons light-brown sugar, 2 1/2 teaspoons baking powder, 1 teaspoon salt, and 1/2 teaspoon baking soda.With a pastry blender or two knives, cut in 6 tablespoons chilled unsalted butter, cut into pieces, until mixture resembles coarse meal, with some pea-size lumps of butter remaining. In a small bowl, whisk together 3/4 cup chilled Sweet Potato Purée and cup buttermilk; stir quickly into flour mixture until combined (do not overmix). Turn out dough onto a lightly floured surface, and knead very gently until dough comes together but is still slightly lumpy, five or six times. (If dough is too sticky, work in up to 1/4 cup additional flour.) Shape into a disk, and pat to an even 1-inch thickness.With a floured 2-inch biscuit cutter, cut out biscuits as close together as possible. Gather together scraps, and repeat to cut out more biscuits (do not reuse scraps more than once). Preheat oven to 425 degrees. with rack on lower shelf. Butter an 8-inch cake pan. Arrange biscuits snugly in pan (to help them stay upright). Brush with 1/2 tablespoon melted butter. Bake until golden, rotating once, 20 to 24 minutes. Serve warm with honey butter or freeze and reheat at a later time. I have reheated in the microwave or in a warm oven with the turkey (10 minutes tops).